1. Melt the chocolate and the water in a bowl set over a saucepan of simmering water, making sure the base of the bowl does not touch the water. 2. Whisk the egg whites, either by hand or with a hand-held electric mixer, in a large clean bowl, until they form stiff peaks. taking care not to knock all the air out. 4. 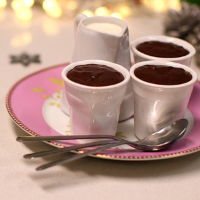 Divide the mixture between 10 ramekin dishes or little cups and chill for at least 3 hours before serving. These can be made in advance and stored, covered, in the freezer for up to 1 month.